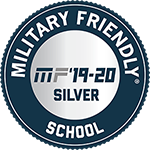 New Horizons Computer Learning Centers announced today that it has earned the 2019-2020 Military Friendly® School Silver Designation. This will be the seventh consecutive year receiving this award. The 2019 Military Friendly® Schools list honors the top 20 percent of colleges, universities and trade schools in the country that are doing the most to embrace America’s military service members, veterans, and spouses as students and ensure their success on campus. New Horizons is a premier training provider focusing on training our Veteran students. This recognition promotes New Horizons' ability and desire to assist Veteran students in furthering their career goals. "Over the last 13 years with New Horizons I have seen life changing transformations. Thousands of veterans, active duty and their family members have entered our doors looking for guidance, help and a fresh start. Without fail we have created an environment where our student can thrive, military or civilian. Today, I love my job more than ever! Being a part of their journey, serving them, is truly a blessing." VP of Career Development, Cindy Sutherland. For more information about New Horizons student veteran programs, visit New Horizons’ Career Development Solutions website at www.careerdevelopmentsolutions.com. The survey is administered for free and is open to all post-secondary schools that wish to participate. Criteria for consideration can be found at www.militaryfriendly.com.